More cores, more performance, more hardware. 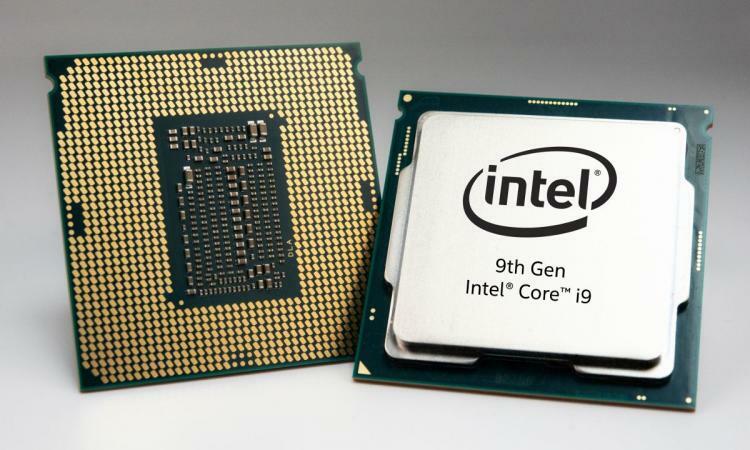 [http://www.intel.com]Intel[/url] are today unveiling the 9th Generation Core CPU family and Z390 chipset, a part set to take the mainstream desktop platform to new performance heights and deep into 2019. Chief among these announcements is that of the Core i9-9900K, an 8-core 16-thread rival to AMD's Ryzen lineup that's clocked at up to an absurd 5GHz, but key performance metrics will remain under wraps until the chips are available to end-users. For now, the focus will be on motherboards, ably supplied by Intel's industry partners and featuring the latest chipset. Last month, ASUS provided members of the media with a sneak peek at their Z390 motherboard range. By giving us a slightly broader than usual priming of the lineup, we have the opportunity to offer this more comprehensive than normal preview of their range. 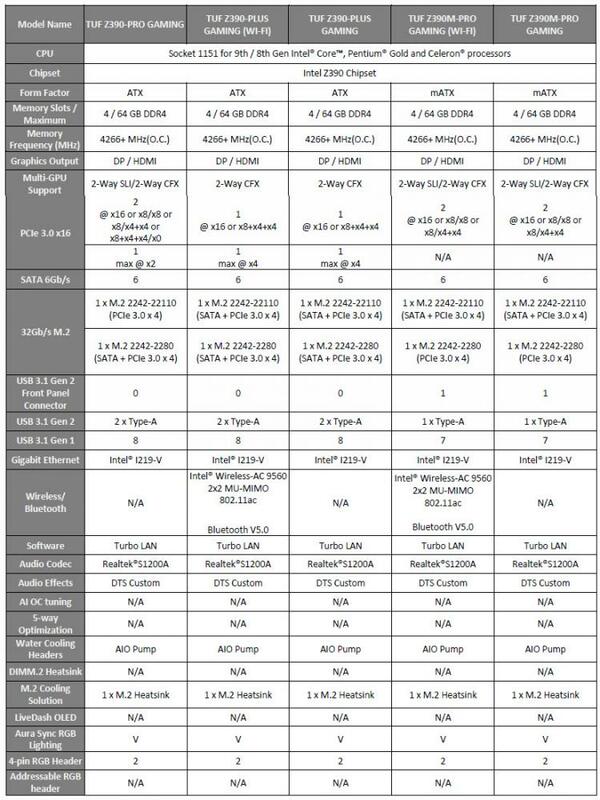 It's fair to say that not much changes between Z370 and Z390 chipsets, so new partner innovations will be particularly important as a means of differentiating them not only from their competitors, but also the prior lineup. Perhaps the most important aspect of these motherboards are tweaks made to thermal design and power management to accommodate the new 8-core flagship. 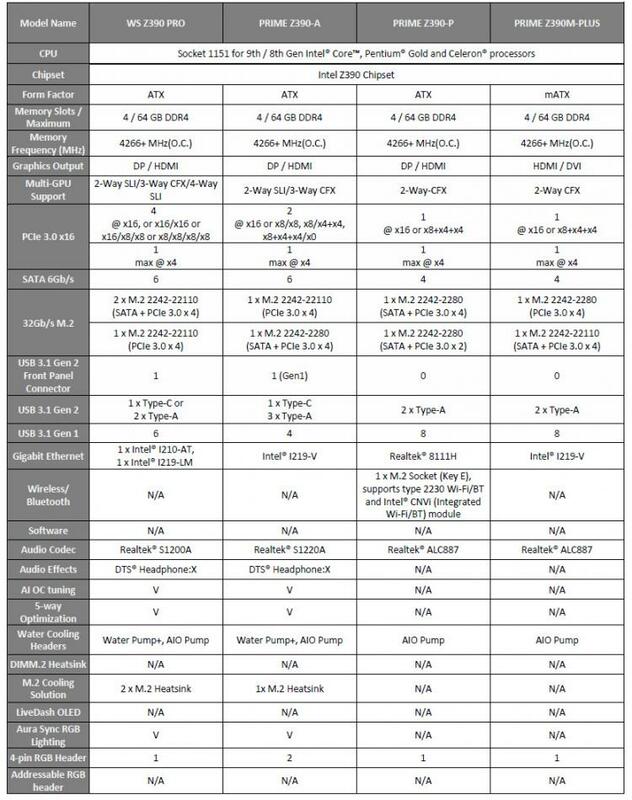 While TDP numbers may not have changed between the 8700K and 9900K, the increased die complexity and power draw necessary to maintain particular Turbo states could have given partners all the impetus they need to beef up these aspects of their Z390 range. Furthermore, extreme overclocking to the limits of the chip will also draw commensurately more power, emphasising the need for more stability (and potentially more power phases). But that can wait for specific board reviews. A broad range, despite few changes at the chipset level. You might expect ASUS to scale back their ambitions with this release given their already comprehensive lineup in the 300-series, but that has proved not to be the case. While the Prime ‘mainstream’ range will comprise only three models, TUF Gaming boards number five and ROG STRIX will number four. Furthermore, the ROG Maximus XI lineup will launch with plans for as many as seven high-end overclocking and enthusiast gaming SKUs. The need to support a variety of motherboard form factors and user budgets is of course a critical factor in determining the range to launch with. However there’s little indication that this is in any way a stop-gap, and as proof comes some brand new proprietary features that various members of their range will debut in the coming weeks. Before we get to the motherboards themselves we’re going to discuss some of those features you can expect to see in the ASUS Z390 stable. They won’t necessarily be present in all, or even most, of the motherboards in their range, but each is well worth more than a mere mention. Every single member of the ASUS Z390 lineup is capable of overclocking a suitably chosen Intel K-series processor, but the tools available to be user will depend on the model. One new option that will be present on Prime Z390-A, WS Z390-PRO, and all ROG models except for the Strix Z390-H Gaming is AI Overclocking. The tool, part of a revamped UEFI, utilises a proprietary algorithm to analyse the quality of the CPU silicon by assessing the performance, temperature and power draw figures over time. From there it can optimise overclocking settings according to each individual CPU and cooling solution to bring the best possible performance within safe and stable settings. More able overclockers in search of personal best benchmarks can also use these settings as a baseline from which to work with, treating them as only very slightly conservative settings compared to those they may be able to achieve. The AI OC settings are presented in the UEFI alongside current values, and so can be adopted or not as desired. Other Z390 members incorporate other ASUS OC features such as the newest 5-way Optimisation software, or as fallback for most modest designs support for the OC Tuner utility. Each is tailored quite well to the market that particular model is aimed at, whether it be newcomers to the overclocking stage or seasoned hobbyists eager to stretch their understanding. Professional overclockers and true enthusiasts will, of course, be well catered to by the ROG Maximus range at the extreme end of the spectrum. 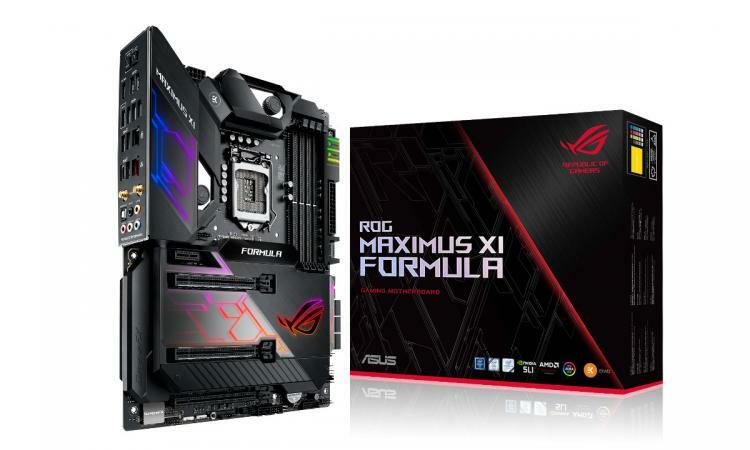 Supported only on the mini-ITX ROG Strix Z390-I Gaming and ROG Maximus XI Gene is a new memory standard intended to let small form factor motherboards retain the full DRAM capacity available to the chipset. Double Capacity, or DC DIMMs incorporate two rows of memory chips onto a single PCB, not quite doubling the chips height compared to a standard DIMM. This allows capacities of up to 32GB per DC-DIMM, letting two DIMM slot ASUS mini-ITX motherboards support up to 64GB in total, the same as the four DIMM slot ATX boards. DC-DIMM is ASUS’s own standard, so it remains to be seen if it will catch on. Two manufacturers – Zadak and G.Skill, will have kits that support the standard as well as RGB lighting. 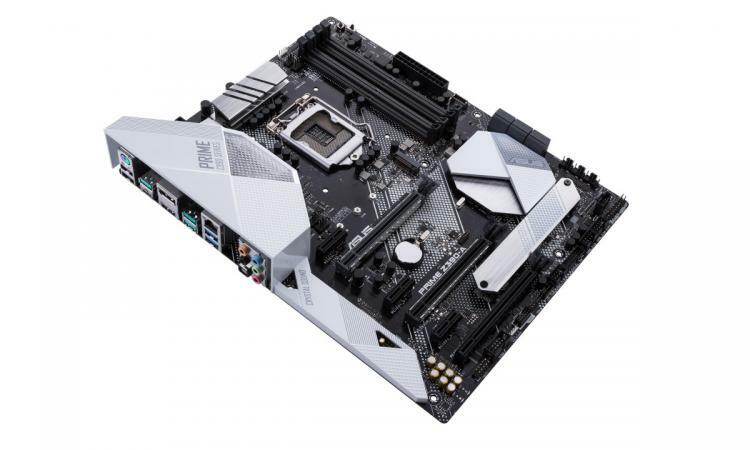 Specific Z390 models are now being manufactured with ASUS’s Optimem II technology. This inserts a new ground plane between memory traces which reduces crosstalk and improves stability, especially at performance limits. ASUS believe that the feature could increase stable memory OC’s by as much as 266MHz, which is certainly going to be of interest to those searching to extreme overclocks or operating on workloads where memory speed and stability is at a premium. The RAMCache utility now offers DRAM information as well as memory bad sector checks in the OS. Sonic Studio can now assign audio outputs on a per-application basis, allowing the user to select specific discrete hardware outputs where the option may not be available in software. SS Link meanwhile can now apply audio effects to all audio devices, not just those attached via a 3.5mm jack. Networking and gameplay has been a focus for ROG, and the latest iteration brings that to the fore once more. Gamefirst V forces gaming packets to the front of the network queue in a process that ROG explain as sidestepping conventional prioritisation. Additionally, if you partner a ROG Motherboard with a ROG Router, the router can be configured such that the ROG System has higher priority on the network, reducing latency for gaming. The ASUS Prime range is primarily aimed at those who desire plenty of bang for their buck, but don’t require some of the more advanced gaming and overclocking features and aesthetics. Combined with the WS workstation line, members of the range are solid options for prosumers and professionals alike. At the entry level are the Prime Z390-P and Z390M-PLUS, ATX and mATX motherboards that are as ‘standard’ as you could hope for and prime for pairing with the new i5 and i7 CPUs. 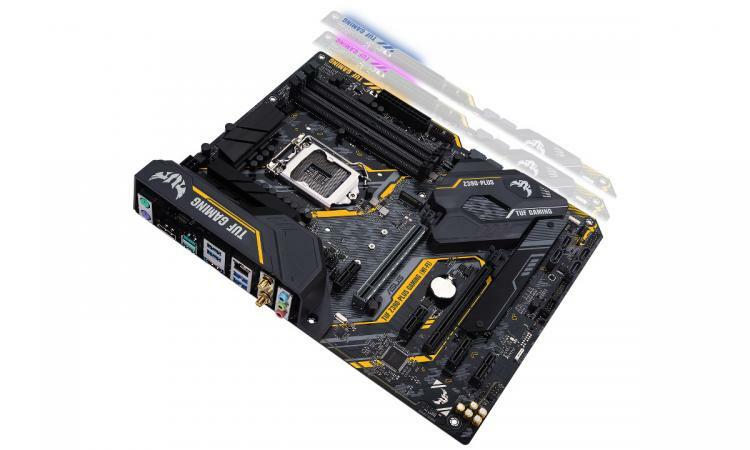 The Prime Z390-A meanwhile is reminiscent of the Deluxe boards – a little more feature complete and with support for 2-way SLI, more SATA ports, a USB 3.1 Gen 1 front panel connector and more. 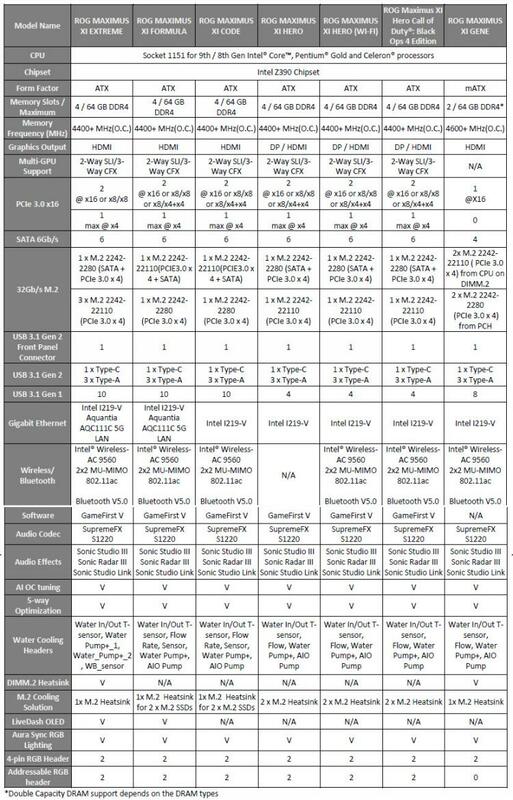 ASUS’s WS Z390 PRO forges ahead still further thanks to 4-way SLI support, x16/x16 and X8/x8/x8/x8 PCIe 3.0 configuration, a USB 3.1 Gen 2 front panel connector, dual gigabit Ethernet and a total of three M.2 slots. The Z390 Prime range starts at £125.99 inc. V.A.T. for the Z390-A, reaching £189.99 for the Z390-A. A full MSRP rundown can be found at the bottom of this article. The renaissance of ASUS’s TUF brand in the recent months shouldn’t have escaped your attention. Once billed as their rugged and most reliable range, the evolving ROG STRIX and Maximus lineups slowly nibbled away at that niche. Now TUF focuses on gaming as TUF Gaming, but with a massive emphasis on wider industry component compatibility to make the process of buying and assembling a DIY PC painless and hassle-free, especially if it's your first. Products sold as part of the TUF Gaming Alliance – a group of major component manufacturers that includes ASUS and other well-known faces such as Cooler Master, Corsair, SilverStone, G.Skill and Micron – are all tested to guarantee compatibility at rated specifications. And these aren’t limited to PC cases and basic coolers; the validated components also include DRAM and PSUs, ensuring stability and durability through convergent industry standards. For this launch, TUF Gaming motherboards will be an option for those who desire ‘gaming features’, but not quite to the extent that they’re available on the ROG Strix range. As a result, they also come in as more affordable options, sitting as a comfortable price compromise between the ASUS Prime and ROG Strix options. And, of course, they also feature the distinctive TUF Gaming black/yellow livery with RGB accents. Sitting at the top of the range is the TUF Z390-PRO Gaming, a £169.99 motherboard that has both extensive gaming and modest overclocking aspirations. Both it and other TUF –PRO models support NVIDIA SLI in x8/x8 configuration, and this is the major difference between it and the more affordable TUF Z390-PLUS Gaming. The TUF Z390M-PRO Gaming uses a smaller mATX form factor, and curiously is the only member of the range to implement a USB 3.1 Gen 2 front panel adapter. This however comes at the expense of a USB 3.1 Gen 2 connector on the rear, two of which are present on the ATX boards. Additionally, WIFI versions of the TUF Z390M-PRO Gaming and TUF Z390-PLUS Gaming are available for a slight premium, featuring Intel 802.11ac wireless networking and Bluetooth V5.0. 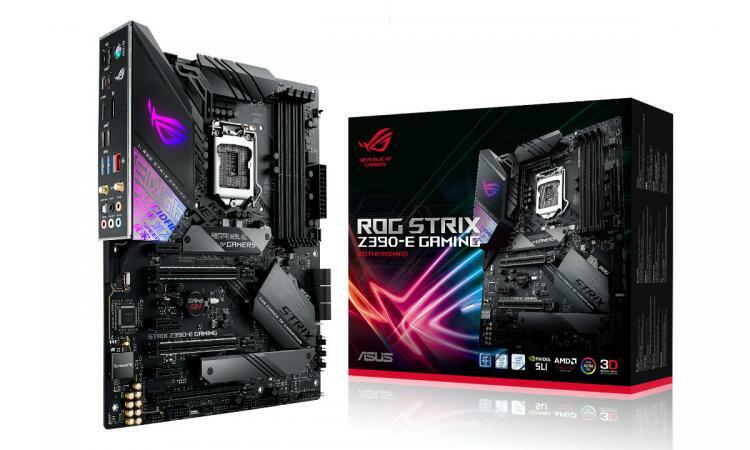 While Republic of Gamers (ROG) is perhaps most well-known for its exceptionally high-end component designs, the Strix brand has allowed them to push many of their development innovations down to more affordable segments. ROG Strix will be offering four discrete SKUs with the Z390 chipset, including the mini-ITX Strix Z390-I Gaming. As you might expect NVIDIA SLI in x8/x8 configurations is supported as standard across every member of the ROG Strix Z390 range that has more than one PCIe slot. Top billing goes to the Strix Z390-E Gaming, which additionally supports Intel 802.11ac Wireless as standard and two heatspreaders for M.2 storage options. 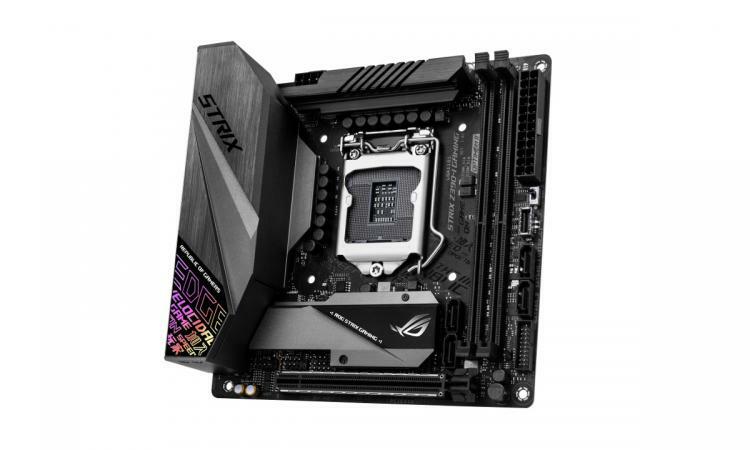 Strix Z390 –F and –H variants retain the ATX form factor but nibble off features such as M.2 heatspreaders, the number of 4-pin RGB headers, and the presence of an addressable RGB header. Nonetheless, each offers just that little bit more than is usual, and on a very attractive overall design. Despite its compact size, the Strix Z390-I Gaming is fantastically well appointed. Size considerations may reduce the number of support SATA and USB ports, but 802.11ac wireless and two M.2 slots are still core to the design. It existence gives enthusiasts the option of a truly compact yet fully-featured gaming system without pushing into the more upmarket ROG Maximus lineup. ROG’s Maximus lineup is, as always, reserved for the very best that possible on Intel’s consumer chipset. Now into its 11th generation (predating even the Sandybridge-era Z68), it leads the way with six major SKUs, from the humble (but not too humble) ROG Maximus XI Hero through to the flagship Maximus XI Extreme. ROG Maximus motherboards emphasise performance, especially overclocking well beyond factory expectations. The designs are often over-engineered to offer exceptional stability at the limits of chip tolerances, and incorporate advanced features which help you monitor key system metrics when overclocking to the limit. In recent generations out-the-box watercooling support has also broadened including, but not limited to, VRM/MOSFET heatsinks with integrated waterblocks. Returning with Z390 is another favourite of enthusiasts: the mini-ITX Maximus Gene variant. This compact design incorporates extreme overclocking support and most of the features you will see on its full-sized equivalents, and may also be one of the first mini-ITX Z390 motherboards to gain a supported 3rd party monoblock for watercooling due to its focus on overclocking. This entire range does however come at a premium. It starts at £272.99 for the Maximus XI Hero, while the flagship Maximus XI Extreme doesn’t have a price attached as yet. Its understudy, the Maximus XI Formula, is priced at an MSRP of £422.99.